I agree that B&W, gold, translucent, etc. is the cheap/lazy way of making figures into "exclusives", and it's definitely not what I would want. But if you look at past lines (not just for DBZ) you'll see that almost every company has released figures in that style. Irwin, Jakks, Bandai, Megahouse, AB, etc. have all made figures like that and were labeled as some sort of exclusive variant, many of which are now hard to find and/or ridiculously expensive. While I hate all of the DBZ figures I've seen with those paintjobs, that TMNT figure that Bardoon posted is quite unique imo because instead of painting the figure white with regular black shading, they actually painted each individual shadow line, making it look exactly like a pen/paper sketch. Something like that would be cool, but I would prefer it to come way down the road. I think the "2.0" idea for rereleases that was being discussed in the Upcoming Releases thread would be a better way to release a SS3 Goku repaint. That way they could paint him with the darker gi and corrected skin/hair tones, then do a full release, rather than only releasing him at SDCC and causing it's price to skyrocket to the same range as the original release. I already have the original SSJ3 and I honestly have no problem with it, BUT if they did make a SSJ3 repaint, I'd definitely get it. I'd rather get a figure than not get a figure lol. SDCC is exciting for the unique release and I always look forward to what they're gonna announce. Pretty much anything Tamashii comes out with I'm gonna get. As long as you act quickly, scalper prices aren't that bad within the first few weeks of SDCC. Plus, they always put the extra stock on Bluefin Premium and I have no problem with a small markup. Who in the blue hell said that the SDCC goku SSJ3 repaint would cost 150+? Maybe he means scalper prices? Who would a black and white Goku pose with? Exactly, he would look weird unless you had him in the middle of your display or something! Hahahaha. Had me laughing. Itd cpst about as much as sdcc vegeta was when he first came out. I dont see why they would release a repaint just to tell it so high. I've dealt with a lot of Exclusive headaches from various lines over the years so I look at this differently than a lot of you all. I want a SSJ3 Goku repaint, but I feel that should be available at a fair price for all and not reserved exclusively for SDCC. That's why I think the SDCC exclusive should be something every collection doesn't really "need" and is a unique one-off much like Arlia Vegeta or Kaioken Goku. Any repaint to a manga/anime color is just pulling one more great repaint re-release from the fans. Look at how the "original designer" Digimon Figuarts re-releases aren't much different from the originals. Because broly was just released does that give him a 0 chance that he could be the next sdcc? Im talking about how movie collection made his hair different colors like in certain scenes from the movie. In one point it was black and another was blue another looked pinkish. I don't think so because his hair already has green shading. I wasnt talking about him having green shading. Now I'm wishing i knew how to post pics lol. The black hair lasted a few seconds, it looked like miscolor error on the artist's part, like when they forget to add Yamcha's scar in a few scenes. The blueish hair was just the angling of the camera and his energy making it look like that. For most of the battle, his LSSJ form was always yellow-lime green. I would buy a repaint of Broly, but I can't really say that I'm hoping for one. 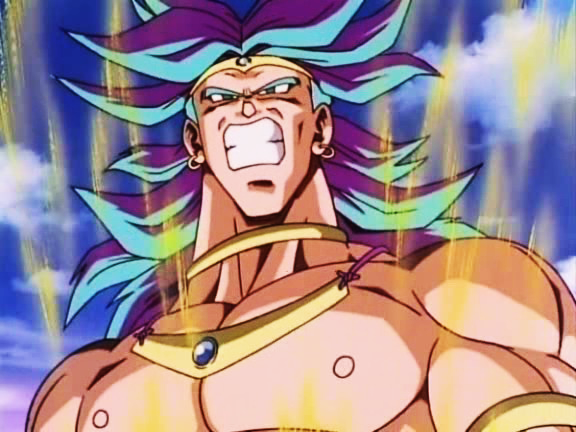 if they were ti make an sdcc broly, i would want him to have the 1wt movie colors. Where his outfit looks more pink and his hair is more pale. You can see it in the pic you posted above, his skirt is a definite pink there. They could totally give Broly the SDCC treatment. Vegeta got it less than a year after release. The only question is why would they want to so soon? Cell definitely needs an update more, not only because his colors are weird but also because its an excuse to re-release a high demand figure. Broly is already accurate enough considering most 3D incarnations have the same colors. Video games and what not. As for wanting Broly to have the pinkish robes and Ascended like hair color you can find a display base with a built in LED light to illuminate him and give an aura like effect. You can go crazy and swap out the led for a different colored one too, for eraser cannon glow effect. Tricks like that won't fix Cell's colors. Sorry, but I still think the cell repaint some people want is an extreme nitpick that is unnecessary in my opinion because its only a lighter shade + why release such a small ''repaint'' as an SDCC? I would rather have a cell re issue if something as nitpicky as an SDCC lighter coloured cell.